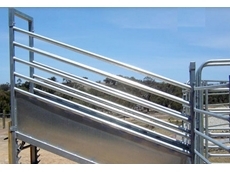 Metalcorp Steel have a comprehensive range of livestock loading ramp options. They are sure to have a design to suit your cattleyard needs. 22/07/08 - National Stockyard Systems offers a wide variety of loading ramps. Hawkesbury loading ramps consist of a galvanised construction with patented concrete floors. These floors are resistant to rot, white ant attack and fire.